That's why Duffy is so unique. He isn't a blatant ripoff of Build a Bear. Yeah, completely agree. Just wanted to add my two-cents on the subject. Though, I'd like to hear why everyone thinks Duffy is unique Not that I don't--I just think hearing everyone's reasons would be neat. I think it'd be kind of nice if some of them could come to the US though--while I agree there's a lot special with them (besides overall quality and the limitedness), essentially anyone who doesn't live in Japan who really loves Duffy won't be able to get any of the outfits...I guess it would just be nice if this wasn't such an issue. I hear where you're coming from, Wondering, but as one of the fans from Tokyo who worked hard to make Duffy a star even when Disney had seemed to give up on him, I think it's important that Tokyo be allowed to keep its own identity as Duffy's "home." Re-releases of old costumes would totally undermine the value of the collections and community that the Oriental Land Company and its fans built over the years, investing in Duffy before Disney started to capitalize (ahem) "care." Yeah, those prices are crazy. Older releases are incredibly expensive even in Japan, but $50 for a ￥600 necklace that's always available is totally ridiculous. I really have tried to make the Duffy Post fees as reasonable as possible for me to still be motivated to do it. I guess the thing for those eBay sellers is that they don't know when or if someone will buy their stuff, so it's a risky investment they're trying to insure a return on, since it's a business. I think it's better both for the "seller" and the "buyer" to work out the transaction together; then neither needs to pay for that extra risk. But then it's also no longer a functional business model. ...I personally feel bad everytime I browse through Yahoo!Japan and see all these US outfits up for overpriced with bids But I'm guessing they won't get those over there either. This is also true, but I don't understand yet why Japanese fans are willing to pay so much. I thought there were some good things happening with the US Buzz Lightyear (though there were also some obvious mistakes) and I think the Parisian costume is cute (but would come with at least a plush bread accessory to jazz it up if it were released here ). But I still haven't seen a US release that totally floors me. I'm hopeful that the Pirate costume might just be "the one." They usually do stuff somewhat-Seasonal here so I do expect some of the stuff to eventually expire--they're just kind of more lenient on it. I too am excited for the years to come with Duffy and what Disney does with him. They are increasing his influence more and more. Recently at the parks I saw quite a few people with Duffy items, and when Duffy came out for a meet and greet a good amount of people flocked to him with smiles on their faces. Although while in the Duffy store I overheard a woman say "Who's Duffy?" and her daughter said "Some bear you dress up.. it's like a ripoff Build a Bear." That's only true if the American market allows it to be/makes it so. 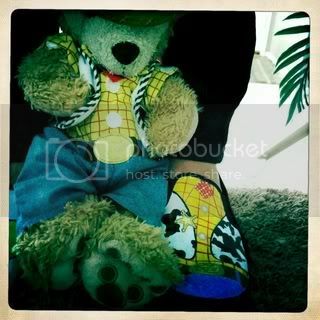 Duffy is NOTHING like Build-A-Bear other than they both wear clothes. I *would* have interrupted those people and explained it to them. If they didn't care, their loss, more Duffy for the ones who do care. Though BAB does make some really cute clothes and 90% of my Duffy's outfits came from there. ...I'd like to hear why everyone thinks Duffy is unique Not that I don't--I just think hearing everyone's reasons would be neat. I completely understand what you mean, but I still think it'd be nice to at least make something similar or maybe different colors. I don't think value would go down too much and even so, I'd like to think the value of a collection is in how much it means to the person, not how much it's worth, otherwise it seems like a waste to collect it. I would also like to see them make some original ideas, however. While the country outfits are nice, they don't give you a lot of options. I'd love to see more casual things or if they have to be themed (which isn't bad), they can make it in a way that it's general--for example, a lot of the Christmas outfits at TD can work really well as just Winter outfits. I was actually talking to a friend about how cool that would be--an exchange thing or just a lot of people working together to make their Duffy collections awesome. I think that'd be really cool. I know older releases are expensive (Like I said, I browse Yahoo Japan :P), but they're at least worth the price listed XD While Ebay constantly jumps them up and it's always so upsetting. I mean, seriously. :/ Your fees are incredibly reasonable, to be honest! Heck, when I feel more comfortable around here, I'm sure I'll place an order I think I just need to figure out everything currently available and add up how much everything would be. I also know a friend of mine adores Shellie May so. Well, probably for what you mentioned before--the collection Having looked through a lot (as I've found usually finding someone OFF auction sites selling is better than using them if you can), I've seen so many blogs with people really showing the US stuff off along with their Duffy despite not being as good, most likely because from a collection stand point, they're quite special. I also haven't been too impressed yet, simply for my general love of accessories overall which the US kind of...doesn't care as much about, sadly. The outfits here are just a hat, top, and bottom usually--if you're lucky, maybe shoes too, but some are even just a top and a hat. On the otherhand, they're all 15-20 dollars which is a lot cheaper than Tokyo Disney. However, since Tokyo Disney includes so many more accessories and things, it balances out. I'd love to be able to split* outfits with someone in the future since one of my biggest issues is only liking parts rather than the full outfit. ...And glad I could help inspire a new thread I'll be looking forward to everyone's responses. A split is essentially when you "split" a product, usually you and however many other people (most of the time, not more than one, but I've seen a few things where everyone takes one part) each pay for a certain part (specified ahead of time) in order to save money and effort (Buying one item instead of buying 5 of the same item and selling what you don't care for). It usually is a 40%-60% split (40 for the outfit, 60 for whatever was wearing the outfit), though, depending on the amount of people, popularity of whatever it is, and other things, the percentages can change. Examples: You see a Duffy wearing a really cute outfit...however, you don't have room or need more Duffy, but would really like the outfit. Splitting with someone who may want more Duffy (or has wanted one for a long time and hadn't been able to get one) will get you just the outfit and essentially makes two people happy with one purchase without having to go and sell it later. Example with just an outfit: You really like the shoes and accessories, but don't care for anything else. Someone only wants the top and bottom...you could split with them and thus, don't have to worry about spending extra on stuff you really don't care for. So I tweeted about this yesterday to F183 to post, but I forgot that MC was down. No sooner when the kilt and french outfit got released, the german outfit was not far behind of getting to the shelves. The CM at treasures that ringed me up at the register said they got them in either last fri or sat. That was quick. For some reason the sleeves and the pants seem to be a little tight for Duffys arm and legs. But I love it! ...I don't think value would go down too much and even so, I'd like to think the value of a collection is in how much it means to the person, not how much it's worth, otherwise it seems like a waste to collect it. I :love: that you've started posting more, Wondering!^^ That is precisely what I meant, the personal value, the feeling of your connection to this character at some specific time for some particular event or one special day... I was never talking about money. I hope it's fairly clear that my passion about Duffy is not even in the slightest way related to how many dollars or yen my collection is worth. To me, it is the priceless embodiment of my understanding of and experience with Disney in Japan, which gave me back the sense of wonder I had for this legacy as a child. My Duffy collection is a cherished celebration of the power of artists working with heart and integrity and my desire to be a part of that. Hence, I think even something like repeated color variations dilutes the creativity of the original design, detracting from both the artistic and sentimental value of the outfit. I also think working on the cheap, with the price point rather than the artistic vision as the bottom line seriously detracts from how I see Duffy. But I was never just talking about money. I would like to see ONLY original ideas. There are a lot of countries left in the world, and an infinite numbert of non-stereotypical ways to interpret them that have not been explored in the least. I think there should be plenty of potential in the World Couture concept. ...Ebay constantly jumps them up and it's always so upsetting. Ebay sellers/"scalpers" buying up stuff they don't care about just to create a product vacuum and artificial demand so that they can sell to people they don't care about really just ruins my day. Those people are trying to turn Duffy into a collectible commodity, but we all know he's destined to be a classic character! ...On the otherhand, they're all 15-20 dollars which is a lot cheaper than Tokyo Disney. Yep, "cheap" is pretty much what I think when I see the US releases. And I guess it just really bothers me because originally - the whole thing that made Duffy so special to me - was and still is that a Duffy bear purchased in Aunt Peg's or McDuck's feels like a rare, precious treasure. Cheaping out undermines that experience and impression. Offering the bears at a much lower price and simplifying costume construction has made Duffy in the US a very different product/character that I feel tarnishes my image of the Japanese original (he is, technically, the original Duffy). Still, the American version is a lovable, accessible crowd pleaser. That's true in Tokyo, too, but the American version likely could not have such wide appeal at the higher price point that Tokyoites are comfortable with and in many ways expect. Japanese fans seem to prioritize exceptional quality and exquisite design at any cost; US fans seem to care more about cheap prices, expecially when it comes to "useless" objects like cute character goods. The markets are very different. I prefer Duffy here, but it's true that I do pay more for it. It's not just about more accessories. It's the base construction. The quality of elements as simple as zippers, buttons, liners, and even stitching is glaringly different between the Japanese and US releases. But, yeah, there are more accessories, too. I'm really excited to see how that thread develops, too! You should post in it! *...A split is essentially when you "split" a product...You really like the shoes and accessories, but don't care for anything else. Someone only wants the top and bottom...you could split with them and thus, don't have to worry about spending extra on stuff you really don't care for. Tokyo outfits are always sold separately from the plush bears, so we don't have to worry about having a collection of bears just because we want seasonal outfits. There are, however, also straps and badges; and occassionally plush pouches with the outfits made on. Just as a note about Duffy Post, I would never be comfortable opening and "splitting" something I was shipping from Japan, even with two Wish Listers' consent. I will ship everything only new and unopened. I just thought I'd make this clarification now, just in case. That sounds like a slippery slope to me. I definitely agree on the original costume concept and other countries. Though, I'm pretty sure they only did the countries they did because they're the countries in Epcot. If they did decide to do more countries, I'd expect to see them during the Food Festival as that's essentially when more countries are introduced (even if only for a short time). But yeah, it'd be nice if they took them to a different step rather than just being stereotypical. I know my boyfriend (He's German) had mixed feelings on the Germany outfit, for example. And I know they could do original ideas if they tried to. Right now, the only original things are some of the Holiday stuff which come ON a Duffy or the Sailor outfit. That's unfortunately true here--while I'm more of a quality person myself over price (And actually, most of my family is in a way--they feel you should go for something you love, regardless of price, even if there's a cheaper version so that's probably part of why I feel that way--it's how I was raised), it's pretty often that people will go based on prices. 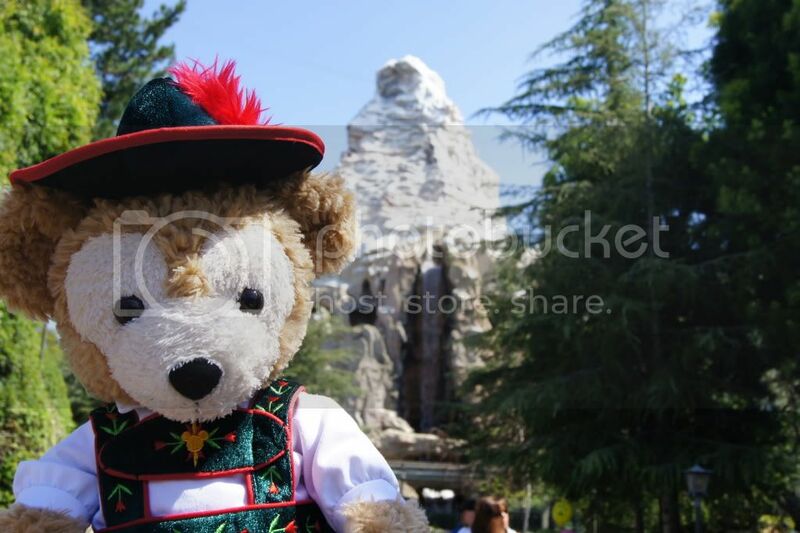 I know the original Disney Bear was like 16 dollars too so I think the actual bear has gone up--just the outfits (which are new) are at 15 right now, which is probably due to the lack of quality. I'd like to think when they have better quality outfits, the price will go up too. 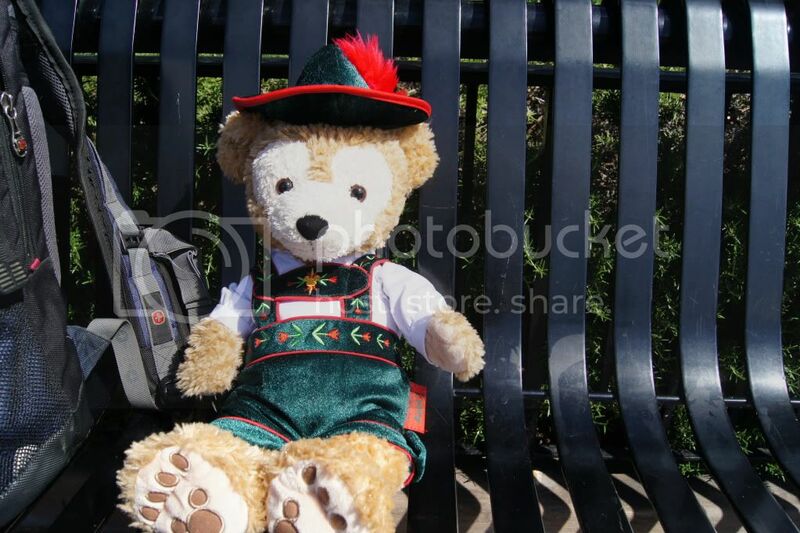 However, one other thing to keep in mind is how expensive most plushies are in Disney too and the economy is pretty bad right now so it's kind of nice to be able to go to Disney and buy an awesome teddy bear like Duffy and I'm sure, when the time is right, it'll go up and people having started low, probably won't mind paying the more expensive prices (For example, a set of dolls I collected started at 60-70 and now go for 85-100 or so...However, the quality has gotten better in a lot of ways so I don't really mind paying more). That's completely true I was showing my boyfriend the accessories from the outfit sets I got when I was at TDS in 2007 (The Halloween outfit, the Pirate outfit, and this one outfit that came with a suitcase and a bottle and some other things) and just from feeling and look alone, he could tell the difference. The main reason I focused on the accessories is a lot of people won't care so much about how it feels and focus more on what it comes with. I personally find both important, but I wanted to bring up how people would generally view it since I tend to be kind of an oddball when it comes to opinions. As for splits--usually those only work if the person who is getting the item only wants part--it's rare a seller does it themselves so I didn't expect you to! XD But yeah, a lot of people would be happy about that. Anyone have a guess on what the next outfit will be released after the Cars outfit? The CM at Treasures in Paradise mentioned another outfit coming soon along with the Cars outfit (she forgot what the new outfit was). My guess would be the pirate outfit (would make sense with Pirates 4 coming out). PS: I really wish our mod would retitle this thread as "New US Duffy merchandise," to keep things organized. I PMd her(?) about it, but nothing happened. If the pirate costume looks like what was in the preview artwork... I definitely want it. It looks awesome. 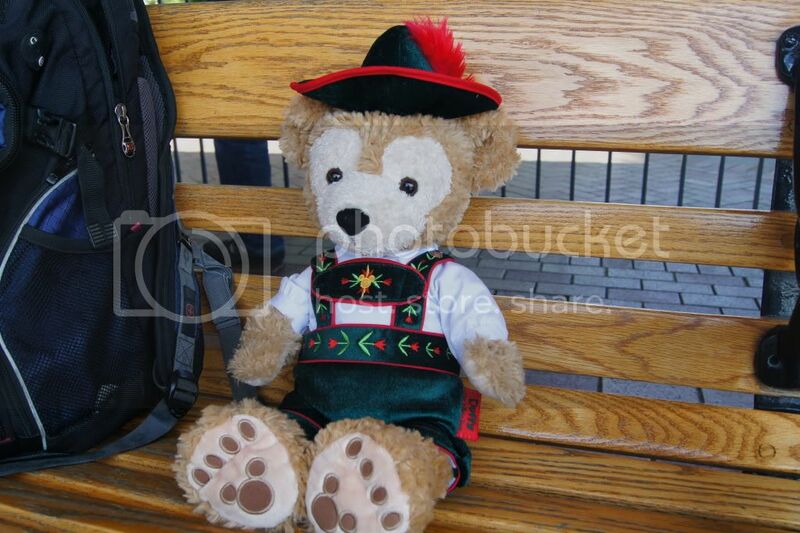 Right now the only Disney made costume I have for my Duffy is the sailor suit. Everything else is from BAB. It would make sense for them to release the pirates outfit by Pirates 4 release, so it should be out within in the next month and a half right? I certinanely hope so! I need a picture of pirate Duffy with Jack Spparow while he's still around! Yeah that's one reason why haven't really bought any of the US costumes. They look cheap. The only one that looks halfway decent to me is the sailor suit, so that's the only one I got and just stick with BAB for the rest. 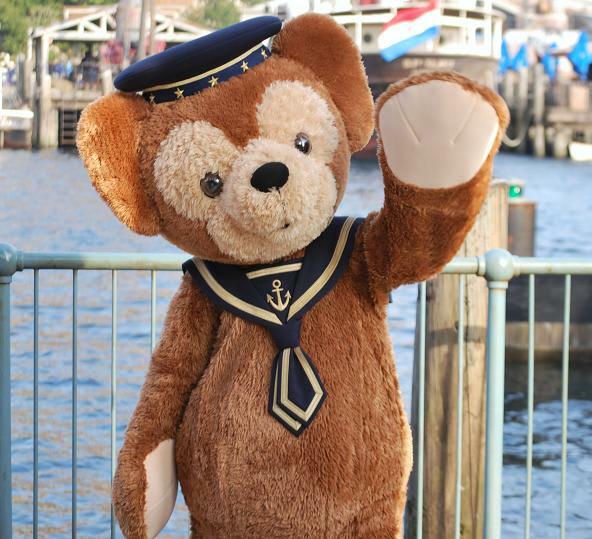 Just curious here, but do they sell a version of the sailor outfit at DisneySea? If they do, is it any different? You can really see the improvement in the quality of materials and construction over the years, especially the sturdiness of the 2010 hat and the true scale and clean details on the tie, etc. Perhaps it really is fair to expect the American releases to improve over time as well; I had almost forgotten that there was absolutely a time when Japanese Duffy releases were more similar to what the US is getting today. Hers is actually a deep red, though it's not so easy to see in this photo. I just realized these suits will be a great match with the Paddington coats. I'll have to try that! All of these costumes were limited releases and none of them are in stores now. OMG Build A Bear just came out with an awesome Captain Hook costume! I saw this costume last weekend. It looks really cute.